Playing in the playoffs for the first time since the 2012-13 Season, the 26th ranked Panthers traveled to 8th ranked Lakeshore High School in Mandeville. The Titans had won 26 times out of 30 games entering the playoffs, but it would be the underdog Panthers’ night. Click here to read the article. One hundred and fifty people filled the Woodlawn library on Thursday, February 21st to welcome prospective students and their families. Multiple Woodlawn programs were represented during the night. 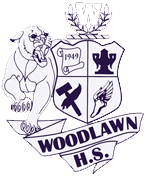 Expectations and policies at Woodlawn were discussed, along with academic expectations, course request options, and special programs at Woodlawn. Finally, parents completed necessary paperwork for various academic programs. For more information, interested persons should contact Ms. Miller or Ms. Watson. The 25th seeded Panthers upset Lakeshore High School Friday night by the score of 60-54. Woodlawn will host ninth seeded Franklin Parish on Tuesday, February 26 at 6:30 pm. Admission will be $8. Over 150 students were recognized by the Woodlawn High administration on the morning of Thursday, February 7 at the annual Honors Breakfast. The students recognized were either on the Principal’s List or Honor Roll for the Fall semester. The students’ breakfast was prepared and served by Chef Oubre’s ProStart classes. Congratulations to these students on their amazing academic accomplishments! Woodlawn High is now ready to begin distribution of Chromebooks to all students. In order for students to receive Chromebooks, parents and students should read the handbook, training Powerpoint, and fill out the appropriate Google Form. All of these necessary documents can be found by clicking here. The East Baton Rouge Parish School System has switched student information systems from Eschool to JCampus, and with this change comes a change in how parents and students will track student progress. JCampus Student Progress Center (SPC) is a system that allows parents to view their student’s school information. Click here to read the article. Zombies, Ghosts, and Clowns! Oh, My!